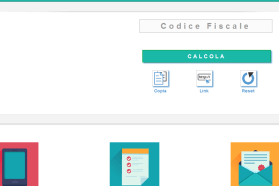 To derive the tax code reverse must enter the tax code in the appropriate field and click on CALCULATE. 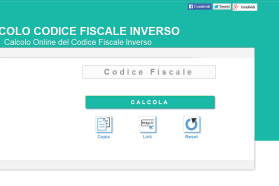 Once you have made the tax code reverse can click on COPY want to use as the data obtained. 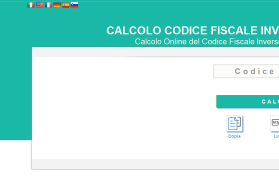 By clicking on the button LINK you can extract the reverse link of the tax code just calculated to share with whoever you want. 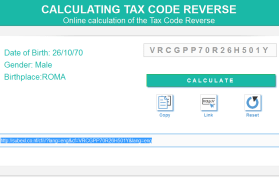 What is the Tax Code Reverse? 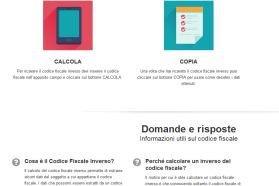 The calculation of the tax code reverse allows to extract some data of the subject to which the tax code. The data that can be extracted from a tax code is the date of birth, gender and place of birth. Why calculate an inverse of the tax code? As you might guess decoding of a tax code does not allow you to get all the personal details of a subject but are those unique. The first and last name can not be obtained because of homonyms. 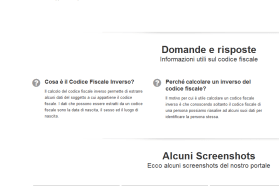 This website has been developed to extract some personal data from a particular tax code.